In the Eastern Church this feast was known as analepsis, the taking up, and also as the episozomene, the salvation, denoting that by ascending into His glory Christ completed the work of our redemption. 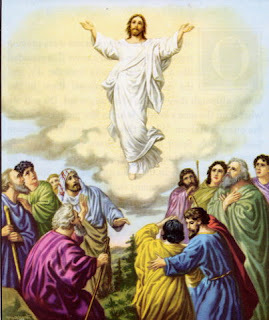 The terms used in the West, ascensio and, occasionally, ascensa, signify that Christ was raised up by His own powers. Tradition designates Mount Olivet near Bethany as the place where Christ left the earth. The feast falls on Thursday. It is one of the Ecumenical feasts ranking with the feasts of the Passion, of Easter and of Pentecost among the most solemn in the calendar, has a vigil and, since the fifteenth century, an octave which is set apart for a novena of preparation for Pentecost, in accordance with the directions of Leo XIII.